CHUCK GIRARD REMEMBERS HIS DAYS WITH THE PIONEERS OF CHRISTIAN ROCK. A couple of years after 1967's Summer Of Love had faded and a generation of hippies were becoming increasingly disillusioned, a new movement emerged on the West Coast of America. Addled by drugs and confused by a myriad of mystic eastern religions and a mix and match of macrobiotic diets and whatever other fads were circulating at the time, a generation of long haired hippies began to turn from the counter culture to discover the realities of a relationship with Christ. The church was the last place they would think of finding the truth but when they checked it out, there it was: life-transforming truth! One of the first bands to mix hippie pop rock music with their new found faith were Love Song. During their brief time together they became catalysts for the whole Jesus movement. Today, more than three decades on, Love Song are still revered. 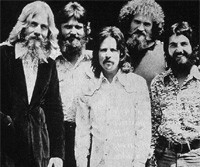 The Encyclopedia Of Contemporary Christian Music called them "the most important Christian rock band of all time" while their seminal self-titled album of 1972 has been reissued several times. At the GMA week in Nashville I met up with Chuck Girard, the singer and composer with Love Song and got him to recall those groundbreaking years with the group. Chuck was formerly of the Hondells and a pop music veteran of surf-and-car songs. Chuck commented, "I guess it's safe to say that I'm a three-hit wonder! With two different groups though. I had a hit in my senior year at high school. I'm older than I look. And I graduated in 1961. In my senior year I had a hit on the Billboard charts with my group that I started in high school. We were called the Castells and our song was called 'Sacred'. It was only Top 20. It never went Top 10 or anything. But it was a big enough hit to give us a taste of success. The preceding record had gone bubbling under on Billboard, which means you don't quite make the charts. Then this one made the charts. Third record went bubbling under. Forth record, which was called 'So This Is Love', went Top 20." Gary was doing studio work and he invited me to be part of the studio crew. So I did that for about four years. I made records under all kinds of different names. We made hot rod albums, surf albums, monster albums. Nothing was ever really designed. In our minds we never thought anything was ever gonna amount to much. But Nick Venet, who had actually been the producer at Capitol Records that discovered the Beach Boys, was now working for Mercury Records. He knew Gary and he ordered an album and this was an album that came out as The Hondells. The first time that I knew the song was on the radio was when I heard it on the radio! It went on to be a Top 10 record - "Little Honda" by The Hondells. So those were the three songs that I was associated with that were hits. A lot of fun. It's just enough fame to keep you going when you've had a little bit of success and you've heard your record on the radio. It's a little more sophisticated now. But I still think for any young artist it's got to be a thrill to hear your record on the radio the first time. It was certainly that for us and that was the beginning of it. I never thought I would do anything any different with my life and I haven't. So it's worked out as I planned!" Girard observed about those times, "From day one, this move of God has been underrated and under reported. From the beginning, I've heard that it wasn't a real revival and that the effect wouldn't last..."
By the early 1970s, Girard's surf and car hits were just a memory and he had teamed with fellow musicians Tommy Coomes, Jay Truax and Fred Field and the band were active on the local live scene before all four were converted to Christianity through attending Bible studies. The group then began playing at meetings organised by Calvary Chapel, the groundbreaking church pastured by a "Hippie Preacher" called Chuck Smith. Today it may be hard to believe that a band playing Christian songs in a pop rock style was something revolutionary. But these are the years before there was really anything you could identify as contemporary Christian music. Love Song, along with a handful of other adventurous bands, were pioneering something very new. Love Song were named before they ever did Christian music. Girard remembered how it happened, "There was a fella named Jack Schaeffer that came up with the name. He was never in the band but he said, 'I've got a great name for a band!' I think he called it 'The Love Song'. We left the 'The' off. When we got born again a few years later we thought about different names, changing our name. We didn't want to do anything gospelly-sounding or religious-sounding. We thought, well you know, we've got a pretty good name because now our music is about God's love. So we just stuck with the name and just figured we'd tell people, anybody that remembered us from before, we'd say, 'Well the band got born again.'" Love Song played locally and toured for months and eventually recorded a debut album which was released in 1972 which captured the pure melody of their music and the strong harmonies of the group. They were uncompromising in the message and the self-titled album became a classic amongst the Jesus Freak generation which was emerging into popular culture from the West Coast. Speaking to Girard about some of the songs recorded in the early '70s, it seemed like each one brought back memories. Talking about "Jesus Puts The Song In Our Hearts", Chuck said, "This was a very special song. We had just gotten born again. We had been living in Laguna Beach. We knew all the drug dealers and we knew we had to get out of there. We were living very well. We were actually a kind of an anomaly for the time! We were hippies with money! We had a little communal kind of setting. About eight or nine of us lived in a home in Laguna Beach. We could put together a couple of working bands that worked in nightclubs so we were bringing home pay cheques. We lived fairly well but we really realised that we had to get out of there because of the influence of knowing all the drug dealers. Knowing all the drug scene in that town." He continued, "So someone 'donated' to us a room for the time being, above a garage. No insulation as I recall. Just the bare studs and the tar paper on the wall and all that. So the four of us each took a wall and put our sleeping bags down. And that was our living quarters for the next three or four months. One night we just pulled out our guitars and were worshipping God. We weren't trying to write a song, even a worship song. We didn't really know about all that stuff in those days. We just were in love with the Lord and wanted to worship him in some way. Fred Field started playing the chords that go to that song and it was created in about an hour, in an act of worship. Everything just came together spontaneously. Even the little round parts, where we repeat the lines. And we sang it the next day in church. That's how I remember it was written on a Saturday night because we sang it Sunday morning at church at Calvary Chapel." It's impossible to underestimate the impact of Love Song in the early '70s. Their 'Love Song' album was hugely influential despite the limited distribution that Good News Records had at the time. In The Encyclopedia Of Contemporary Christian Music author Mark Allan Powell boldly called it "the best Christian album ever recorded, on a par with 'Sgt Pepper's Lonely Hearts Club Band'. However important the music seems looking back, Girard and the band didn't have much of a clue about how important it was. He observed, "Everything that happened in those days was pretty much without planning or guile or the way the industry runs today. We were sort of inventing the rules as we went along. Of course there was a music scene but we weren't really a part of that because our music was so different from what would be considered standard gospel. So we didn't really know, in any way, how to function. It was just live performances. You played at churches. You played at a campus, with all the radical students. Every kind of situation was presented to us. So you had to kind of write the rules as you went along. There were no trade journals in those days, no radio stations actually playing the music on any regular basis. Once in a while somebody would pick up a song and play it in the context of the rest of the music but it wasn't until years later that there were actually speciality stations. CCM came along a few years later, which was the first contemporary Christian music magazine." Continued Chuck, "The things that are concerns today weren't even on our minds. Like nowadays everybody's looking at demographics and who your core audience is and radio-friendly records and all that. Our music was just music that came from our heart, our experiences with the Lord. We had some industry input. When we finally did get signed to a label and records started to come out there was input. But we really were blessed to be able to make the records that we wanted to without any considerations for industry kind of things." Girard's daughter Alisa is a member of the popular girl group ZOEgirl - soon to disband - who have been very successful in the modern CCM scene. Girard observed, "We've had an interesting time watching her sort through the stuff the industry throws at you, having been raised by us and seeing our struggles with the industry. It's quite a different thing today. But back then we were inventing the rules and building the roads. It was a lot of fun in some ways. It was frustrating in other ways. But I think at the very end of the day, it was a really exciting time of innocence and new beginnings. People were really wonderful to us. People in the churches where we went to play where we looked quite different from them, embraced us. And the industry largely embraced us. It was a good time overall." These days amongst older Christian music fans, Girard is a little bit of a living legend. He's still making music and ministering. Was he aware that he's a living legend? "It is both an honour but at the same time a bit embarrassing," he responded. "I know almost better than anyone that the whole era of the '70s Jesus Movement was an extraordinary visitation by God. I was a musician that responded to his love and he allowed me to be a part of something very amazing. I'm grateful for his anointing on my music, and that he's allowed me to be used into the fourth decade. So, being called a living legend from time to time massages my ego in a good way, even though I know that the source of anything I've achieved is God's plan and me involved in that. God is the true living legend." Love Song only recorded two studio sets in the early '70s - their self-titled debut and 'Final Touch' - as well as a live album recorded on a reunion tour in the mid '70s. A few years back, the band reformed to re-record some of their classic songs with new arrangements for a project called 'Welcome Home'. With heartening modesty Girard plays down "the greatest Christian music album" claim for 'Love Song'. "I'm too close to it to evaluate that kind of observation. I know this: It was born from a lot of prayer and was a collection of songs that truly came directly from the hearts and lives of a bunch of very grateful guys. I also must say that assigning 'best of' titles to anything which is creative is so subjective. Who makes that evaluation? Are they qualified to do so? It's all just an opinion, and everyone has one. Truth is that there are always many works which mean so many different things to so many people, that making such judgements only contributes to a spirit of competition and can hurt feelings of those who think their work is just as important as the next guy's. From the day that the first CCM magazine came out with best of lists, I have felt that this kind of thing is a copy of the world, and really has no place in Christendom. But again, if you have to compare, it's still flattering to have your album named best." Considering how important the Jesus Movement era is for the development of contemporary Christian music, it's amazing how little has been written on the subject. From nearly 40 years away, it seems like it was a genuine revival with thousands of people sweeping into the Kingdom and as the '70s unfolded, a large number of bands and artists emerging using rock and pop to reach others. Girard observed about those times, "From day one, this move of God has been underrated and under reported. From the beginning, I've heard that it wasn't a real revival and that the effect wouldn't last. It was criticised by some because for the first time in modern history, Christianity 'became cool'. The conventional thinking was that since it was the "in" thing to get born again, that many if not most conversions were shallow and wouldn't last. 40 years of history have proven that idea to be very wrong. As I travel even today, there are thousands who come out to the concerts, who have a story, who still love and serve God 40 years later. I believe that it was in every way a true revival, and that the effect was staggering." He continued, "Another factor may be that the times were so 'laid back', that it may not have been the trend to document the event. There was certainly a leadership gap created by the hippie kind of attitude of the day that may have spilled over into the reporting of the phenomena. It's just an observation. The spontaneity of the event may also play a part. It was all about Jesus and his message of salvation. No one sat around a table formulating a plan. People weren't thinking about personal gain, documentation, or that we might even be making history in a way. So now we are left with our memories for the most part and no one even seems to be thinking about documenting it even today." By the mid '70s, Love Song went their separate ways. Girard explained why it happened. "You have to remember that the band were baby Christians thrust into a position of great, great popularity and fame for the day. And it happened very quickly. Once the media hit Calvary Chapel, it grew from about 200 to 2000 in less than six months! And within that period of time all the media were flocking down there to get soundbites and interviews. It was a great place because you had this cross-section of people from every strata of the culture. The straight people, the little old ladies, businessmen, hippies. So we had all of this happening to us so quickly and our star rose very quickly. Interestingly we never were together long enough to really become internationally famous, in the sense that we travelled much as the group. But our records made it worldwide and then we travelled throughout the US and Canada. It was a lot of pressure on us, to answer the question. As young Christians, our look was very 'heavy'. We looked 'deep'; like we really were these mighty men of God when really we were just a bunch of baby Christians. At the end of three years there were a number of factors. Part of it was that we were trapped by our own fame. That first album was such a part of the DNA of so many people. It meant so much to so many people that it was hard to move past that. You'd try to introduce new songs and people would tolerate them but it was more like, 'Okay, we want to hear the ones on the first album!' So it was really hard to introduce new material." "... the straight people, the little old ladies, businessmen, hippies. So we had all of this happening to us so quickly and our star rose very quickly. Interestingly we never were together long enough to really become internationally famous, in the sense that we travelled much as the group..."
Girard paused and reflected, then observed, "There was a lot of talent in the group. There were writers, a lot of singers. There wasn't enough space on the album for people to have a place to express their talent. So we just kind of felt at the end of about three years that we were on a roll. We were at the height of our popularity and were uncomfortable in this particular wineskin. So we decided to disband. The kind of deal we made with the Lord was, 'If it's not of you make us miserable and if it's okay with you let us have a peace about it.' Everyone felt a peace about it. Some of the guys went on in music and formed other groups. I stayed a solo artist. Some of the other guys didn't get right back into music. But we needed room to grow as Christians and I think that's really what it produced. Now I never really got out of the performing or the ministry scene but it was a whole different thing to be solo as opposed to being in a group. So for me it was a liberating experience as well. We just needed it for growth and it was the Lord's time, as I look back on it." "30 years after the group split, there are still occasions when the band will get back together to play concerts. Girard observes, "None of us ever closed the door to this wineskin, and there have been opportunities over the years to reunite. There was a great confusion in the early '70s when many hippie types equated the lifestyle and values of the hippie lifestyle with true Christianity. Christianity is not about a culture, but about a relationship with Jesus, which is played out in many cultural settings. Many hippie types left the Church when they saw cultural change and a diminishing of hippie values. Today, they are wary and unhappy with the current Church and won't attend a service. But they will go to a concert. To me, this is the main value of a Love Song or any other reunion concert of a defunct group, and I'm always open to the opportunity." These days Chuck Girard is mostly involved in worship music and his long solo career has included many releases that are also worth checking out. But that's another Cross Rhythms feature! YOU CAN FIND THE ORIGINAL ARTICLE ON CROSSRYYTHMS.CO.UK HERE.